Eve and Adam is...well, it wasn't what I was expecting. I went into this novel confident that it would be yet another sci-fi novel that would fail to surprise me and after the first few chapters, I thought I had the romance and plot figured out. Well...I hate to admit this, but I was wrong and I am so glad I was! Eve and Adam, contrary to my expectations, did manage to be an exciting, intriguing, and unique novel - all aspects that make it stand out in its over-populated genre. Yet, despite its redeeming qualities, I am sorry to say that in the end, I still felt as if Eve and Adam was simply...missing something. Eve and Adam starts out with its main protagonist, Evening, getting into a bad car accident and consequently, barely surviving in a critical condition. When her mother, the owner of a well-known genetic research lab whisks her away from the hospital and to her own facilities, Evening doesn't question her. Instead, she heals at an alarmingly quick rate and resorts to working on one of her mother's latest gadgets - designing the perfect human. While there, Evening meets Solo, the handsome son of her mother's now-deceased business partners and an unlikely friendship is struck between the two. Yet, dangerous - and possibly illegal - things are happening at the research facility her mother owns and while the truth lays before her, Evening has to make the choice whether to accept it or not. I've said it before, but it demands to be repeated: Eve and Adam was very unexpected. For one, I did not expect this novel to be told in dual narration, switching from the perspectives of both Evening and Solo and later on, Adam, the human Evening unknowingly helps create. Unfortunately though, this dual narration falls short simply because Evening's perspective is dominating. Solo has very few chapters dedicated to his narration which I believe is one of the more egregious flaws in this novel, simply because Solo's narration is far more interesting, compelling, and intriguing. Yet, even beyond the issue of the narration, I was surprised to see that the first-half of this novel was practically entirely dedicated towards character-development. I am all for character-development, but nothing truly happened during the first-half of this story and everything that did happen revolved around Evening's best friend, Aislin. Aislin's boyfriend, Maddox, is involved with drugs and this issue is then used as an excuse for Solo and Evening to bond together while also developing the friendship between Evening and Aislin. I truly appreciated the friendship between Evening and Aislin - especially as the novel progressed - and I even liked how the relationship between Solo and Evening was developed quite well too, but I think this could have been done in a manner that contributed to the plot opposed to one that veered off from it rather randomly. Thus, comparatively, the second-half of this story had a tight, concise, and fascinating plot that the first-half rather lacked. It was fast-paced and interesting, but it also showed the inner dilemma Evening faced between the truth of her mother's genetic facility and her own confused feelings towards a mother who obviously loved her, but never spent enough time and affection on her. I especially loved this conflict as well as the issues that stemmed between Aislin and Evening as well as between Solo and Evening. I think more than just the plot of the second-half, the relationships took an interesting turn that I definitely wasn't expecting and I loved that. What else wasn't I expecting? Well, let's just say that there's a major jaw-dropping moment nearing the end of this novel that completely made my day. It took me completely by surprise and although I think I should have seen it coming, the fact that I didn't went in favor of this story. Still, despite the fact that I enjoyed reading this novel immensely, I have to reiterate that it lacked something; something was simply missing to take this incredible idea from a great concept to great execution. I doubt that many others will have this same feeling, but for a reader who plans on becoming a Biology Major with a specialization in Genetics, I just wanted more. I loved the setting and idea for this novel, but I wished we could have gotten more details, particularly about the genetic lab. We are told that horrible things occur in this facility, from green pigs to dogs with human ears, which is obviously disgusting and terrible, but I never quite felt the horror we were meant to experience. Furthermore, I wanted Eve and Adam to focus on the motivations behind these scientists, on the corporate politics clearly taking place in this situation, on what other functions the lab served for, etc. It simply could have given us so many more details and the lack of world-building made this story feel flat to me, so I wasn't exactly invested in this. Overall, Eve and Adam is a remarkable story that is unique, intriguing, and definitely has its fair share of plot twists. Yet, in the end, it is also a novel that seems to lack just a little something more to take it from good to great. While I wasn't overly impressed with this book, I am still curious enough to want to pick up the sequel, especially due to all the unanswered questions the reader is left with at the end of this novel. It is a short story and one that I wish could have had a little more in it as it had the potential to be a lovely stand-alone, but I'm interested to see in which direction its plot goes. It also helps that there isn't a love triangle at all in this one and that the characters and lively, headstrong, vivacious, and actually intelligent. 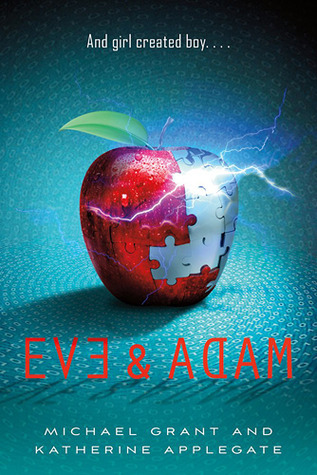 Eve and Adam has a lot going for it and I am confident that even newcomers to the science-fiction genre will fall in love with this one. Thank you to NetGalley and Macmillan for providing me with a copy of this book in exchange for an honest review. I just finished this one too Keertana! Unexpected is a good way to describe it:) I didn't realize it was going to have quite so much humor throughout, and I really liked the light nature of it, it didn't seem to take itself too seriously. I agree, they definitely could have dived into the reasons behind the Adam project and the scientists' motivations (maybe they will in the sequel?) but all in all I just had fun reading this book and I'm glad you enjoyed it for the most part! I'm reading this now and I must say it's a lot different from what I thought it would be. A lot funnier than I expected, too. That scene with Maddox and those Vietnamese guys felt completely out of place, though. I can't wait for things to speed up in the swcond half. I'm having loads of fun so far, but not much is happening at all. Amazingly detailed review as always, darling. This seems like a book that I would like but not love but who knows! I'm so curious about the twist now and I LOVE that it's so unpredictable. I wouldn't have known about the multiple perspectives either. Even though it never really quite reached its potential, it sounds like such a fun, enjoyable fast read. I don't know that I've seen any reviews for this one yet. And I haven't really paid it much attention, honestly. But it sounds interesting. I do agree that character development is fantastic, but if nothing much happened I think I would lose interest. I need development WHILE stuff is going on. I think I'll have to read a few reviews of this before I make a decision of whether I'll read it or not. I love dual narration.... when done right. It's a shame that the most intriguing POV was given less page time. The second half of the book sounds fantastic, though unfortunate that the first half had excellent character development, yet lacked plot. Characters are vital, yes, but so is plot! I'm really excited to discover what this jaw-dropping scene toward the end is!! Not entirely sure what my thoughts on this will be - so many varying opinions! - but you HAVE captivated me enough to go see for myself. Brilliant review, as always! This will go to my TBR pile list :) Btw, I have a giveaway of Audrey's Guide to Witchcraft by Jody Gehrman. It's a YA-Paranormal and it's for US/Canada (signed copy) & International (ecopy). Check it out? This book is great so far. Great descriptive words and details. I can't wait to read the whole thing. Definitely recommended.